But it turns out that excuse, to put it delicately, is utter horseshit. The first FAA study, done in the 1970s, assigned a group of men cognitive tasks at 1,300 feet and with oxygen levels that mimicked 12,500 feet in altitude, both with and without the confidence-building benefit of a screwdriver. Though booze definitely affected how well the men performed the tasks -- “alcohol at ground level resulted in significantly impaired performance” -- the change in altitude didn’t worsen their cognitive decline. In 1985 the FAA repeated the study, and arrived at pretty much the same results. Granted, planes fly at 30,000 feet, so one might reason the effects would be stronger. But the air in planes is pressurized to oxygen levels of about 10,000 feet. Why do we think altitude affects intoxication? Most of the urban legend around altitude and alcohol stems from a highly under-researched study from the 1930s. In this study, Columbia University psychologist R.A. McFarland examined the interaction of alcohol and altitude and concluded that two to three drinks at 10,000 to 12,000 feet was equivalent to four or five on the ground. The study was taken as truth, and for some reason the later studies never managed to debunk it in popular culture. But while medically, people may not be more intoxicated at altitude, there are reasons they might feel a little more impaired than while on the ground. This is why a study on skiers in the Austrian Alps found that while alcohol may have accelerated the effects of altitude on their cognitive ability, the effects at certain blood alcohol levels stayed constant between sea level and 20,000 feet. Unless you’re planning to crack a bottle of Dom at the peak of Mt. Everest, being higher isn’t going to intensify the effects of that bubbly. 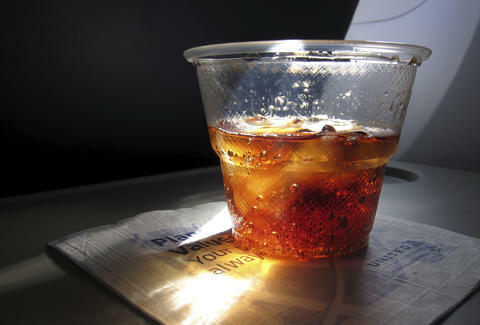 People also claim their hangovers, or just general alcohol-induced discomfort, are a lot worse when they fly. But again, this has nothing to do with the altitude, but more with the germs and lack of moisture in the air on planes. So while it’s still maybe not the best idea to treat a plane like your own personal Bourbon Street, understand you’re no more intoxicated mid-flight than you’d be at the airport bar. 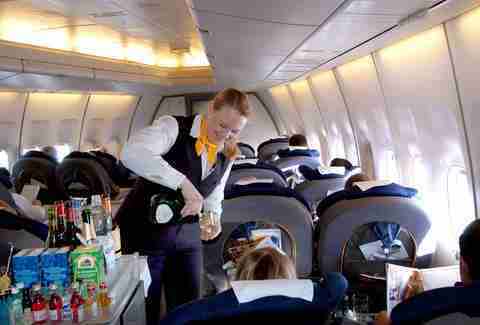 You might feel worse, or even a little dizzy, but it’s not because the drinks are “hitting you harder.” Just like alcohol does when you’re sad, angry, or a little bit amorous, the booze is just amplifying your already-crappy condition when flying on an airplane. So maybe hold off after the first time the beverage cart goes by. Matt Meltzer is a contributing writer to Thrillist whose only onboard vice is Biscoff cookies. Follow him on Instagram @meltrez1.